GP6 Lesson - A drummer at home, how is that possible? You would like to have a drummer ready whenever you want to go along with your latest guitar riff, your new composition, your favorite song? This is all possible with Guitar Pro 6! Writing a drum rhythm with Guitar Pro 6 is both easy to do and to visualize. Here are a few examples to support and guide you when you create your own. Let’s start with the famous “Billie Jean” groove by Michael Jackson, which is just a few clicks away! Create a new score and add a drum track (menu “Track” > “Add”) by choosing “Drums and percussions” > “Drums” > “Drumkit” in the “Select your instrument” window. Start out by writing 8 Charleston eighth-notes above the staff. 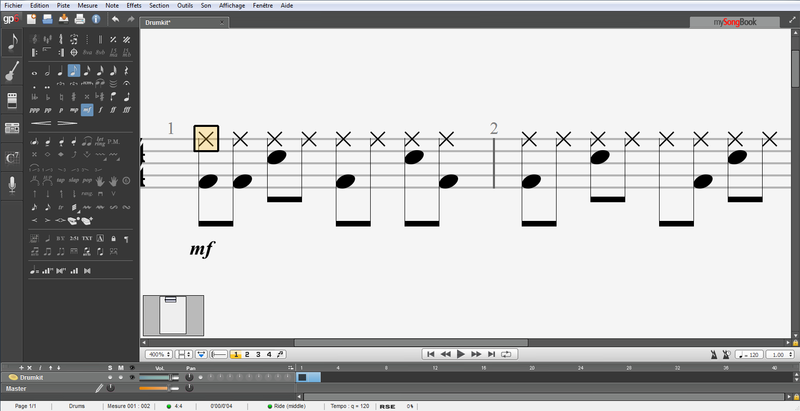 If you do not feel comfortable with the drumming vocabulary, go to “Display” > “Fretboard/Keyboard/Drums” for editing. Add the snare drums on the second and fourth beats — that’s your famous “Backbeat“. Then the kick on the first and third beats. 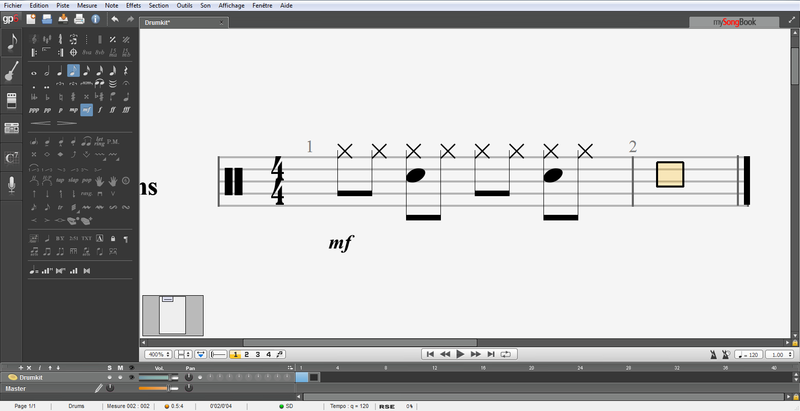 You can also lower the Charleston crosses by a half tone, and there you get the same rhythm but on the Ride cymbal. Add a Crash cymbal on the first beat instead of the first Ride or Charleston hit. 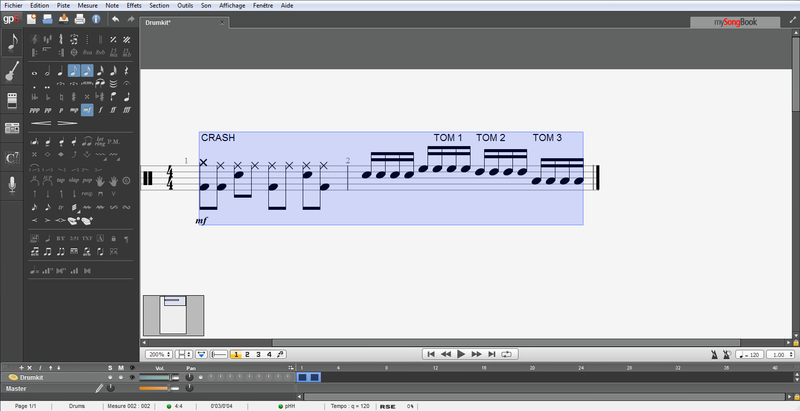 Try writing some drum breaks by using the Toms. Please note that you can select various drum tones by using the “Effects” and “Mixing table” panels to the left of your screen (effects pedal and mixer pictograms). 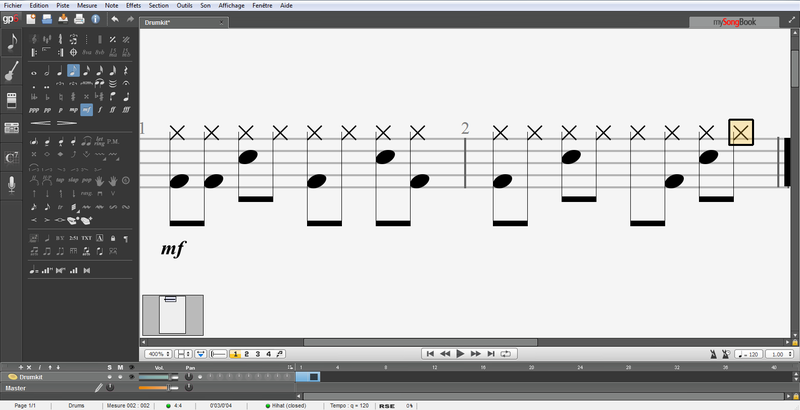 I am making available here a bunch of rhythms in .gpx format. They are merely following one another, so cut them, copy them, and mix them… In other words make good use of them, enjoy them, and find your inspiration to write whichever ones are running inside your head! Following ten years of musical studies at the Lille Jazz Conservatoire (gold medal), as well as at the London “Drumtech”, Guillaume Deffrennes has been teaching drums both in music schools and as a private teacher. He has founded the learning website http://www.jouerdelabatterie.fr (online drum-playing method). Guillaume Deffrennes has been part of a variety of musical projects since 2004 in jazz, French Folk and Rock music, including covers and street performances, and has acquired a great experience of the stage, playing at over 300 concerts. Don’t hesitate to visit his YouTube and Soundcloud pages. Thanks for your comment! Tabla drumkit is not in the works, I’m afraid. Exactly what I was looking for, thank you so much ! Hello! Thank you very much for ерш lesson! I actually trying to solve compatibility issue between GP and Logic Pro X^ may be you can help. I creating drum tracks in GP and using export – midi – import function to add it to logic and have good drum sounds. The issue I facing is that drums set and types of hits doesn’t much between Logic & GP. For instance – in GP we have four hat sounds – pedal, closed, open, half. But in logic it has only Closed, Open & Pedal. So info on Half is just not available and lost after midi import. I read that Logic using mod while to manage dynamics (like Closed with mod shell engaged is kind of half) but this is not helpful as info already lost. Do you have any idea how to overcome this problem? May be review midi file in proxy software, re map absent tracks to unused in logic and then map to them proper sounds in Logic? Can you recommend such a software?